A photo that I had forgotten taking! Devon Samson is a large floating crane used by the Royal Navy which I caught on camera sailing into Devonport Dockyard back in July. I did try to find out more about this impressive beast but drew a blank! Devon Samson used to be called London Samson & was built for The PLA (Port of London Authority)in the early to mid 60's. She had her name changed when She came to Plymouth, she was powered by 6 deisel engines & 2 Voith Scheinder propellers. The crane has 3 hoist systems, a 5ton jigger, 20ton Aux hoist and 120ton max lift on the main hoist. I belive that the PLA had 2 vessel's made, so she has a sister but do not know what happened to her? The sister was the London Leviathan my dad worked on both, the visible difference betwen them was the Leviathan did not have the basket at the top of the jib that the Samson has. 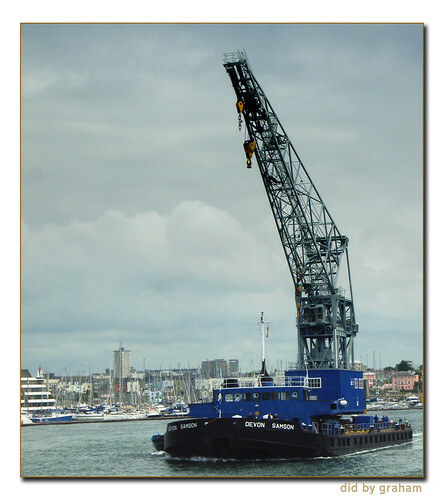 The other difference was in the lift, the Samson had a 120 ton lift and the Leviathan a 60 ton lift.